Revisiting Acquiring John Mayberry Jr.
John Mayberry Jr. rounding first base after hitting the game winning single, Opening Day 2011. 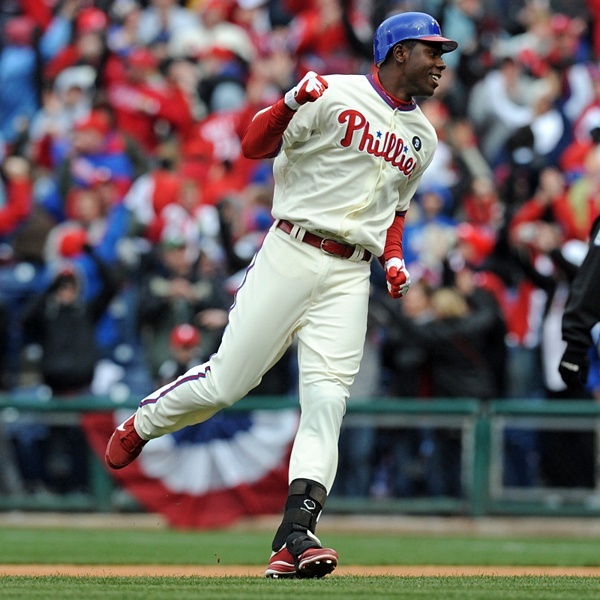 The Phillies entered the 2011 season minus an All-Star right fielder, down a top prospect, and with a lot of question marks after Ryan Howard‘s place in the line-up. An unlikely hero was found Opening Day when John Mayberry Jr., the fourth or possibly fifth outfielder at the time,had a pinch-hit single in the 9th to start the Phils’ season with a win. The 27 year-old Mayberry is a former first-round pick out of Stanford by the Texas Rangers. Drafted in 2005, Mayberry showed promising power in the minor leagues in four seasons with the Rangers, while displaying poor plate discipline and propensity to wiff. With a triple slash line of .258/.330/.458 in the minors entering his age 25 season, Mayberry, at 6’5 and 220 lbs., was a decent power threat and had a 80.95% success rate on the base paths. Entering the 2009 season, the Texas Rangers fielded an outfield of David Murphy, Marlon Byrd, Josh Hamilton, Nelson Cruz, and Andruw Jones. While being a 25 year old in Triple A doesn’t mean your ancient, your chances become increasingly difficult to reach the Major Leagues if you haven’t gotten there yet. Unfortunately, baseball is a game of labels. And with 331 games played in Triple A through the 2008 season, Texas thought it had the book written on Mayberry. Ruben Amaro Jr., another Stanford graduate, took over as Phillies’ General Manager following Pat Gillick’s retirement in November 2008. While some may think taking over a championship ball club is easy, Amaro faced a number of challenges in his first off-season as GM. His first decision would be whether or not to re-sign Pat Burrell, who the Phillies had drafted first overall in 1998 and had been a Phillie since 2000. Burrell was the Grand Marshall of the 2008 World Series parade and amongst the primary right-handed power threats for the Phillies for nine seasons. Amaro also had to decide whether or not to offer arbitration to players like Greg Dobbs and Eric Bruntlett, key reserves on the 2008 squad. And most glaringly, Amaro had to find ways to plug holes on the Phillies’ bench and upper minor league systems that were patrolled with names like T.J. Bohn, Mike Cervanek, and Brad Harman; with a bullpen that relied at times on Les Walrond, RJ Swindle, and 39 year old Rudy Seanez. One of Ruben’s first moves went under the radar: Amaro traded once promising speedster Greg Golson for Mayberry. The trade at the time did not get tremendous amount of press other than the obligatory line in the transaction column on November 20, 2008. Phuture Phillies blog, which continues to this day to be the top site for news, analysis and daily box scores of all Phillies’ prospects, was just about the only link I could find that has reflected on the, at the time, seemingly inconsequential trade. Responses to the trade at the time ranged from upset Phillies fans who saw Golson as the future in the outfield, after all, Golson’s slash line was .263/.309/.398, averaging over 31 steals a season with a 79.01% success rate on the base paths in 5 minor league seasons with power that increased each year, to promise that Mayberry would provide right-handed power off of the bench and the capability to spell Howard at first base. Other responses inspired indifference. In their analysis of the deal, Phuture Phillies declared the trade a win for Amaroand praised his “outside the box” thinking in a rare prospect for prospect move. They cited Golson’s ceiling as a hitter and his even higher propensity to strikeout as glaring weaknesses in Golson’s game. They projected Golson as a 4th or 5th outfielder, one whose value became his abilities on defense and the basepaths. Meanwhile, Phuture Phils’ cited Mayberry’s improving walk rate, plus power, and his ability to hit left-handed pitching as preferable moving forward for the team. Mayberry did not make the big club out of Spring Training in 2009. The Phils signed Raul Ibanez in the off-season, retained the services of Matt Stairs, and acquired right-handed hitting Ben Francisco in the Cliff Lee trade. He did, however, make a splash in his Major League debut with the team at Yankee Stadium, going 2-3 with a 3-run home run and a double. Perhaps the most memorable moment for the fans watching at home, however, was Fox incorrectly identifying John Mayberry’s father in the stands. It is now 2011. Mayberry saw limited action in 2009 and 2010 with the Phillies. With the departure of Werth and injury to Dom Brown, Mayberry cracked the big club out of the gate on opening day. He had a walk off-single and has hit .255/.359/.418 with 2 home runs and 4 steals in 31 games across all three outfield positions and first base. Will Mayberry remain hot, or at least consistent, enough to continue to patrol the outfield for the Phils? His main competition at this time, Ibanez and Francisco, have .225/.281/.338 and .218/.327/.346 triple-slashes respectively against Mayberry’s .255/.359/.418 in similar sample sizes. At the very least, Mayberry looks like a bigger threat to lefties than Francisco and provides a better arm and greater defensive range than Ibanez. Even with Brown’s call-up looming, I wouldn’t be surprised if Charlie kept Mayberry in the line-up due to his versatility, plus power, and smarts on the base paths. And even if Mayberry should remain a role player, it is clear that Amaro got the better end of his first trade as a Major League GM. Mayberry has Golson beat in the triple slash and BB:K ratio, even when adjusting for his time outside of the hitter friendly PCL and appears to be a better player at this point in their respective careers. Golson remains two years younger, but at this point, Amaro’s shot in the dark at acquiring Mayberry looks like it may be a slam-dunk. Don’t forget to follow @MaGelb and @phuturephillies on Twitter for the latest in Phils and Phils’ minor league news.